"It's my duty to shape that booty," says celebrity trainer, Dolvett Quince. And according to him, your desk can double as a gym for getting lean and mean at lunch time. Want an excuse to take a break and get a killer bod in the process? Quince developed this 30-minute workout just for you. It's designed to tone everything from the shoulders, arms, core, and thighs to the aforementioned booty. And it can be done right at your desk. Ready to roll? Watch the video to see exactly how to do these lean muscle-toning moves. 1. Warm up and fight carpal tunnel syndrome by rolling your wrists. 2. Work your core with leg lifts you can do while seated—4 sets of 10 to 12. 3. Tone your arms and work your shoulders with 4 sets of 10 to 12 tricep dips. 4. Get toned glutes, quads, and hamstrings with booty squats—4 sets of 10. 5. For more seated work, do 4 sets of 10 single-leg lunges, then pulse, and repeat with the other leg. 6. No need for free weights—hold your chair on either side of the seat back to do 4 sets of 12 bicep curls. Boom. But you're not done just yet. Quince wants you to follow this routine up with a sensible lunch comprised of lean protein, smart carbohydrates, and plenty of vegetables. "Smart meal, smart workout, smart you," he says. Forget about those funny looks you're expecting to get from coworkers. Once they see your results, they'll be begging you to show them the ropes. In which case, share the health and direct them to this video. Quince will whip the whole office into shape in no time. 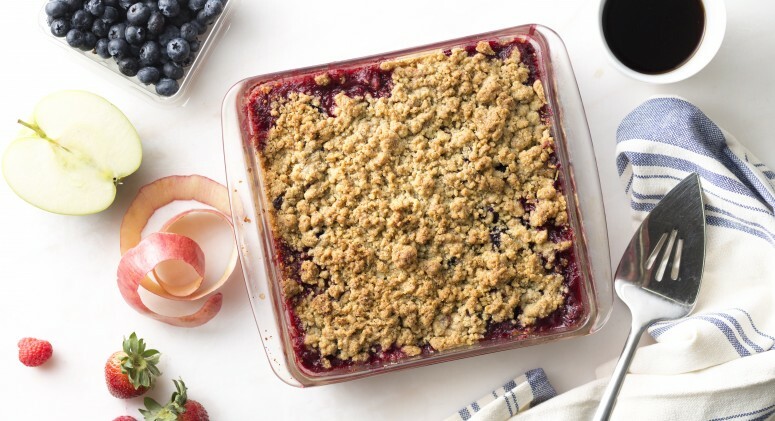 Love Berry-Apple Crisp? Don't Miss Our Gluten-Free Version!